These chocolate covered peanut butter balls are easy to make and sooo addicting! I made a batch for Father’s Day and they were a huge hit. Mix peanut butter, honey, vanilla and almond flour (preferably with an electric mixer) until thoroughly combined. Melt chocolate in a saucepan on low heat (or in a microwave), making sure to stir periodically. 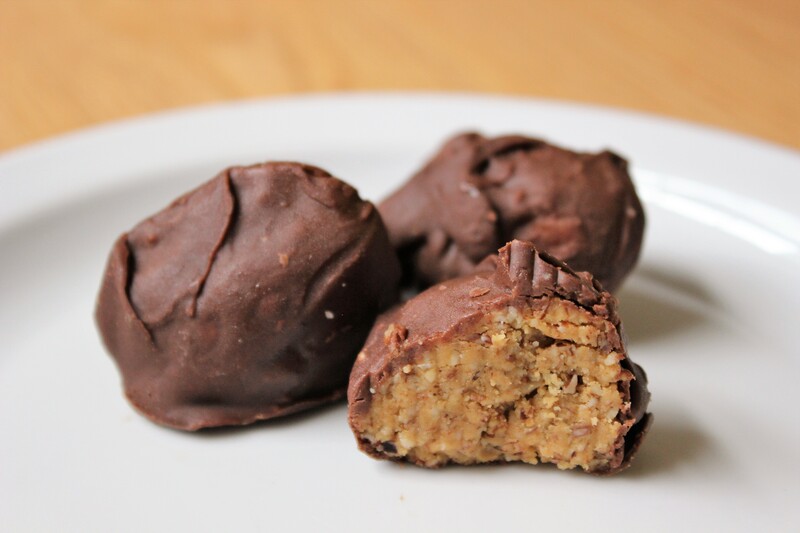 Roll peanut butter mixture into small balls and dip in melted chocolate. Place balls on cookie sheet lined with wax paper and refrigerate at least 1 hour before serving. I recommend storing these in a closed container in the refrigerator, as the chocolate will easily melt in the summer heat. Enjoy! Yum, I’m going to have to try these soon!